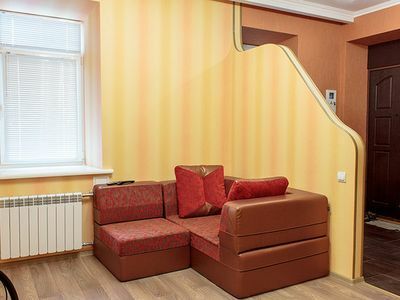 Nice 2-rooms apartment for nice price! 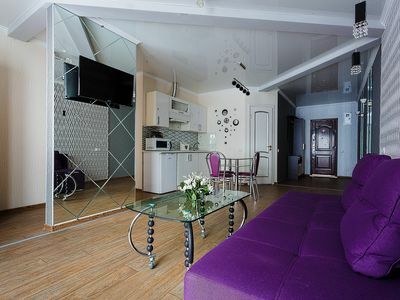 The apartment consists of kitchen which also serves as welcome room, a bedroom and a bathroom. Careful consideration has gone into flexible sleeping arrangements, sufficient bathroom, contemporary lighting and a warm comfortable atmosphere. 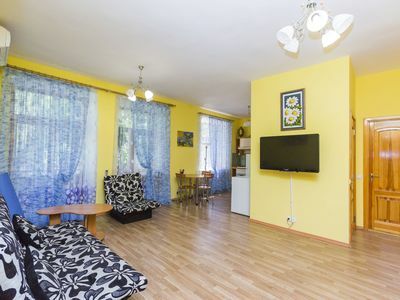 The kitchen has a large sofa (which can serve as an extra bed), large LCD TV set with satellite channels, , dining table for four persons, the kitchen has top of the line furniture with modern appliances, gas stove, cooker hood, air conditioner, refrigerator, microwave, cooking utencils, etc. The bedroom has a king size bed and wardrobe with a lot of shelves where you can place your personal things. The bathroom has a nice green colored decoration which fits into apartments design and interior. It also has a washing machine, a sink and cozy shower cabin. Guests will be offered a warm welcome and all will be done to ensure your stay here will be as enjoyable as possible.